Power Tee is a great tool to help kids learn to like and play golf, improve their swing and stance, and practice hand-eye coordination. The hot shot on the left is Tommy Morrissey. He is a 0 handicap junior golfer, which is amazing on its own. But - Tommy Morrissey only has ONE arm. He is competing against able-bodied kids, and beating them all over the course! Tommy is nothing short of incredible, and his swing will leave you amazed and inspired. Check him out competing against PGA Tour golfers in the "One-Arm Challenge". Izabelle Spearman may be the daughter of a golf instructor, but that doesn't mean the talent is genetic! Mitchell knew how important it was to get his daughter practicing golf early and often, so he bought a Power Tee for his garage so Izabelle could easily practice anytime she wanted. She loved Power Tee and how the ball came right back up after she hit - it was like a game in itself! As time went on, her swing got better and better. Watch Izabelle's first time on Power Tee, and then watch her swing only 6 months later! Maybe Max will shoot a 58 one day too! Max likes Power Tee because it makes practice so easy - no need to bend over and re-tee the ball, so you can just focus on hitting the spot! Speaking of which, watch Max's on-target shot and his pure, unfiltered joy. 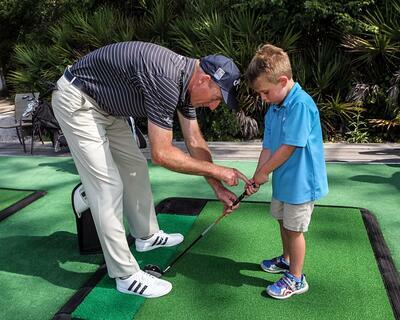 If you'd like to help your kids or grand-kids fall in love with golf and enjoy practicing so much more, visit a Power Tee range today, or purchase your own Home Use Unit for inside or outside your home!